One of the few topics that still interests me regarding unopened packs is fun packs. By definition, we can’t really know exactly what fun packs were produced, so all we have to go on is what is found. It seems likely to me that a transposition error occurred here between the 12th and 14th Wrapper packs, since I have never seen or heard of the combinations described here. I also wonder about the 2nd UK Pack described here. With a 2nd UK puzzle piece it would be difficult to tell the difference from a normal 2nd UK pack except if a non-matching sticker showed through the front. I have contacted Scott a couple of times which is always fun but less than helpful. If anyone owns or has seen fun packs different from the ones I own please let me know. Re: Which Fun Packs Exist? Don't know if this bag had ever been confirmed to exist or was just a theory but I came across an unopened Topps fun bag and it contained the clear cello with 8th series stickers and 1st series UK checklist. Ern, do you know where the mother lode of these cellos originated from? Early on they were not common, then all of a sudden they were extremely common. 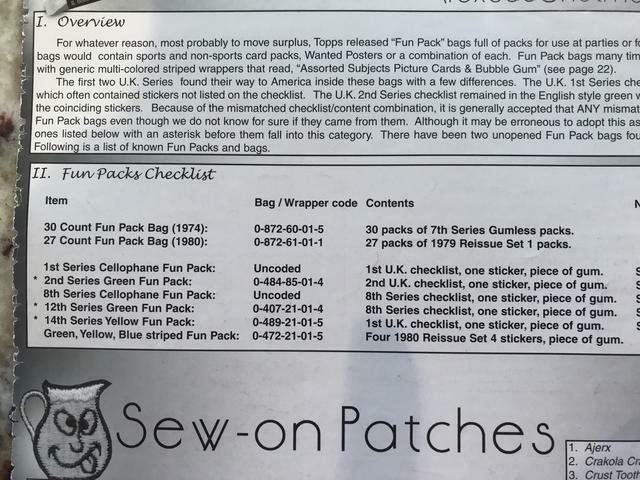 I have two 1974 fun packs both have the 12th series wacky's in them. (along with 1974 football, baseball and Full pack baskeball), I had 4 but killed off two of them. One guy i traded with had a fun pack that had 1976 Wackys in them. (16th series). I was a doubter so he sent me a picture and sure enough they were in there. What were the 16ths wrapped in? There is a theory that those "mystery" funpacks could have series 16 and/or 1979/80 wackys in them. I always wondered if Shedds might be found in them too as I bought this mother load of wackys off ebay once that had only series 16, Shedds and reissue stickers, no puzzle pieces. Just seemed to be an odd collection of wackys whose only association was timeline but the lack of puzzle pieces was odd. The ones I came across were from Connecticut but I couldn't never get a straight answer from the guy on where he got them. we talked and he sent me a picture. I didn't believe it at first. I think I might still have the picture in an email I will look it up. It has been a year since we talked though. When you say "pak" are you referring the the plastic fun bag? So he has a funback with series 16 packs in it? This makes sense as I posted in one of these threads that I have an advertising sheet that shows a funback with series 16 wackys so I figured they must have existed.